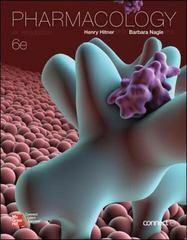 Pharmacology: An Introduction 6 Edition Pharmacology, 6e by Hitner/Nagle is incredibly readable, with short chapters that link theory to practice; content that is focused on the need-to-know information to not overload the reader; excellent tables and features such as Patient Administration and Monitoring Boxes. This new edition now has a 4-color design with all new photos and illustrations. Chapter reviews have been revisited to add additional problem types and an exercise progression from simple to complex. The full suite of instructor materials is available. Hitner 6e has Connect Plus, including LearnSmart: Pharmacology, body system and pharmacology animations, Top 250 Prescribed Drugs, Dosage Calculations Exercises, and more.